New York City Is Getting An Autonomous Shuttle. Would You Use It? New York City is getting its first autonomous shuttle, as self-driving company Optimus Ride will debut autonomous shuttles in the Brooklyn Navy Yard sometime in the second quarter of 2019, as reported by The Verge and other outlets. Optimus Ride, a Boston-based company spun off from MIT, focuses on geo-fenced, fixed-route shuttles. Unlike AVs being tested by Waymo, Uber, GM Cruise, and others that are out in the wild on city streets, these shuttles are more analogous to airport people-movers or Disney theme park shuttles, constantly operating along the same, short, specific, simple route in controlled environments. Current fully-automated driving can handle these scenarios pretty well. A driverless shuttle without in-person human monitors was used in Las Vegas during the 2017 CES conference and pilot programs have been rolled out around the world including in the UK, France, Australia, and Singapore. The shuttle doing shuttling in California. While the world waiting—and waiting and waiting and waiting—for fully-autonomous vehicles to work out the many kinks in their systems on actual roads, AV shuttles on fixed routes in specific areas may sneakily prove to be the tortoise that catches the hare. 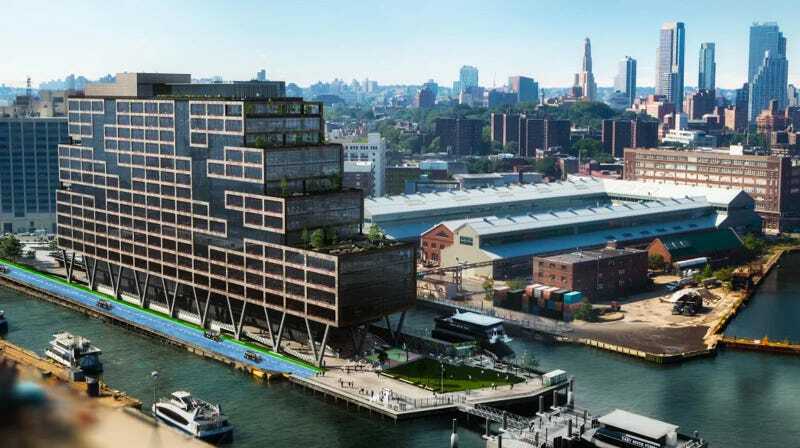 As for the location in New York, the Brooklyn Navy Yard “makes a ton of sense,” said Ro Gupta, CEO of Carmera, a company that makes maps for AVs and is based a few blocks from the Navy Yard. It’s a neo-industrial park that the city is re-fashioning into a tech/startup/manufacturing hub. The roads are private, which provides the legal cover for the program in the first place, but also means they’re not subject to the usual madness of New York City streets. But the Navy Yard is large enough that a shuttle to get around could actually be useful. The Yard itself is far from public transit by NYC standards—the closest subway is a good 15 minute walk away—so anything that cuts down the travel time within the park will help. Starting in May, a new NYC Ferry stop will open there, providing easier connection to Manhattan. Of course, this only exacerbates the concern that the people who actually benefit from the safety and efficiency improvements AVs have to offer will be wealthier, leaving the middle and lower classes outside the touted autonomous revolution. But in theory, such buses and shuttles would catch on elsewhere if the kinks are worked out. Along with the Navy Yard, Optimus Ride also announced plans to launch at Paradise Valley Estates, an upscale retirement community in Northern California, as well as Brookfield’s Halley Rise development in Reston, VA just outside of Washington, D.C.
At the same time, of course autonomous vehicles are coming to upscale shopping malls, condos, and retirement communities first. How silly of me to expect anything else.